You’d be forgiven if you would exclude Athens from a list of the most dynamic technology startup ecosystems in Europe. As the Greek economy slowly recovers after a devastating financial crisis and the results from consequent austerity measures, calling its capital city a decidedly thriving hub for tech innovation would be an overstatement the size of the Mediterranean sea. The ‘European Digital City Index’ (EDCi), a Nesta-produced index that attempts to capture how well different European cities support tech founders, ranks Athens 56th out of 60 tracked cities across the EU, with particularly low scores for digital infrastructure, entrepreneurial culture and market conditions. However, after I’ve spent a couple of days walking and Uber-ing around Athens to meet with dozens of entrepreneurs, investors, city officials and ecosystem builders, I’ve concluded that its startup scene is heading in the right direction, albeit with a few caveats. Yours truly was invited earlier this month by Found.ation, an incubator and digital transformation school that has recently released a report on the Greek startup ecosystem(s) in collaboration with its partner EIT Digital. You can (and should) consult the report here for some facts and figures to set the scene. In summary, Greek startups have raised roughly 250 million euros in the past few years, and has enjoyed a number of exits (more on that below). However, the report also clarifies that Greek startups have co-founders from abroad and/or offices in other countries “in order to increase their chances of receiving international funding or take advantage of other benefits, such as avoiding high taxation or complex bureaucratic procedures”. Indeed, according to the European Startup Monitor, the majority of European founders have created their startup in their country of residence (79%), with the surprising exception of Greece, where most (75%) of the founders come from other EU countries. The same report says Greek startups (42.3%) are funded mainly from the founder’s own savings, coming second only to the United Kingdom. In addition, only 36% of Greek startups have received external capital, mostly in the range of €25,000-€50,000. European startups hire 12 employees on average (including founders), but in Greece this number drops to a mere 5.5. In fact, according to the European Startup Monitor, Greek startups plan to recruit only 2.6 employees within the next 12 months (as opposed to 5.8 of the European average). Obviously, any report on the state of the Greek startup scene today will tell you that there’s a lot of work to be done. As for my own observations and thoughts on the Athens startup ecosystem in particular, they are a bit of a mixed bag – with an overall positive conclusion. The elephant in the room is that startups in Greece can, for the first time, count on a rather sizeable influx of capital to help kickstart or grow its operations. Last year, the European Investment Fund helped establish a de facto fund-of-funds of up to 260 million euros to establish new – and support existing – investment firms as they scout for fresh talent or experienced entrepreneurs ready to scale their businesses. 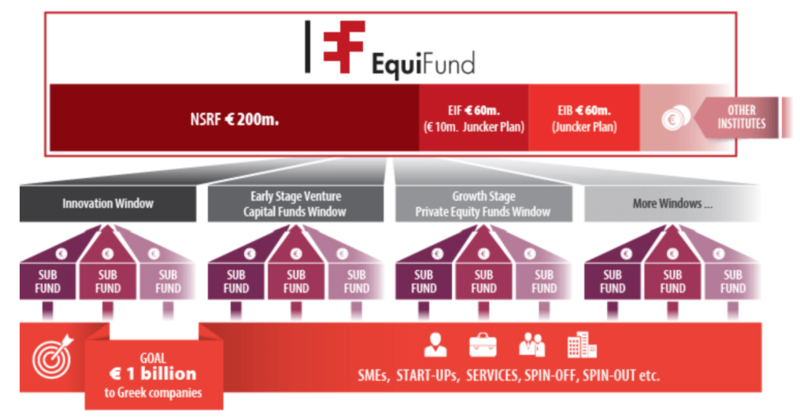 The so-called EquiFund is thus bigger in size than the total of cash invested in Greek startups in the past seven years, according to the aforementioned Found.ation/EIT Digital report, and it doesn’t include the private capital that will be raised and deployed by fund managers in addition to that. The general expectation is that roughly 400 million euros will be pumped into the Greek tech scene in the coming years. That is a lot of capital for a still small ecosystem, and my concern – echoed by many people I’ve had the chance to meet during my visit – is that it will eventually have a perverse effect. Are there enough up-and-coming founders with good enough ideas and healthy doses of ambition to fill the pipeline with sustainable startups? Are there enough educated investors to serve as fund managers to build a track record strong enough to ensure a follow-up of private and/or public capital injections? And is throwing money around going to be enough to rid Athens/Greece of a number of systemic challenges? Only time will tell, but it does mean crunch time for Athens’ fund managers and entrepreneurs; effectively a chance for them to show their worth and put the city squarely on the European tech map in the next 5-7 years. Another aspect that becomes plainly obvious when you spend enough time talking to people within the Greek startup ecosystem: the government plays little to no role in its development. While many welcome this, would prefer the government to stay out of the way, and regard any current and future interaction with officials an utter waste of time, it remains the question whether this is really healthy for the future of the ecosystem. Can Athens really evolve into a thriving tech hub without entrepreneur and investment-friendly policies fit for the wonderful world of tech startups, and can it flourish without thoughtful implementation of policies to attract and retain tech talent from abroad? Again, time will tell, but the fact is that there’s almost zero dialogue between Greek startups and the federal and municipal governments – I simply can’t see how that is a positive thing in the long run, given the many positive examples of the opposite in many other places in Europe. Talent, in turn, is not something Athens has a shortage of. There are plenty of skilled engineers and developers to go around, and at a fraction of the cost of tech talent in places like London and Stockholm, considering also the relatively low cost of living (in relation to the quality of lifestyle, to boot). I’ve also met with a number of founders of startups that are starting to scale, and clearly have the potential to have bigger outcomes than has to date been the case. Sure, there have been exits in the past, but this concerned mainly marketplaces being sold to bigger European players (Taxibeat to Daimler, for instance, or e-food to Delivery Hero) or companies getting acquired after building very specific types of technology – such as Innoetics to Samsung, Avocarrot to Glispa and Altair buying Solid Iris Technologies. Intale is a Web application which provides a retail platform for small shop owners. The software collects data and translates this into reports, allowing shop owners to manage stock, customers, orders and suppliers with little fuss and maximum efficiency. Merchants can see how products are performing and even gain an insight into consumer purchasing behaviour. Intale aims to connect and unify the retail market by bridging the gap between major suppliers, small shop owners and consumers. Hundreds of retailers use Intale Point to manage and control their store’s till, shifts, warehouse, suppliers and customers. They have improved and increased their daily transactions, growing their business. Workable is a popular recruiting software, trusted by over 6,000 companies to streamline their hiring (also check out our earlier interview with the company’s co-founder and CEO, Nikos Moraitakis). From posting a job to sourcing candidates, Workable provides the tools needed to manage multiple hiring pipelines. Transparent communication, organised candidate profiles, structured interviews and a full reporting suite gives hiring teams the information they need to make the right choice, effectively replacing email and spreadsheets. Blueground leases and furnishes high quality properties and, subsequently, rents them out to senior business travellers on a medium and long-term stay basis. Currently operational in Athens, Dubai, New York and Istanbul. The idea was born out of one of the co-founders’ experience as a business consultant and frequent traveller, and Blueground’s clients include the likes of Coca-Cola, H&M, Samsung, LG and IKEA. The company raised 5.5 million euros earlier this year. Pollfish is a platform that delivers surveys online and via mobile apps on a global scale, enabling its clients to survey millions of respondents in real time, 24/7 the world over. Obviously and unfortunately, I didn’t get to meet everyone and visit all of the organisations doing great work in Athens and beyond, but if you’re really interested in learning more you should also check out Metavallon, Orange Grove, iQbility, EGG, Starttech Ventures and Corallia. In any case, what is vastly encouraging to see is that people who have been active in the ecosystem for a long time are also stepping up to the plate to support Athens in its next phase. Case in point is Dimitris Kalavros-Gousiou, the founder of the aforementioned Found.ation, who is poised to play an instrumental role as one of the general partners of Velocity, a new pre-seed and seed investment fund (more on that in early 2018). Also worth noting is the work being done by couple Maria Calafatis and Stavros Messinis, who started the first coworking space The Cube in Athens back in 2013 and continue to serve as a platform for the community to come together and create. Shying away from any type of public backing, they’re following another course than most, but it’s an admirable one. Finally, two young investment firms that are worth watching are Marathon VC, which was co-founded by George Tziralis (previously of OpenCoffeeClub Athens and OpenFund fame) and Panos Papadopoulos (who has an interesting resume of his own, not in the least for building and eventually selling Bugsense to Splunk). The second is Venture Friends, co-founded by former investment banker George Dimopoulos and Apostolos Apostolakis, the first angel investor in local success story Taxibeat (now Beat). Between those, there is enough educated talent and goodwill to support and finance the next generation of Athens-based entrepreneurs. It’s up to both founders and investors, and other actors in the broader ecosystem, to showcase that Athens has what it takes to deserve a solid place on the radar when it comes to Europe’s developing startup hub(s).